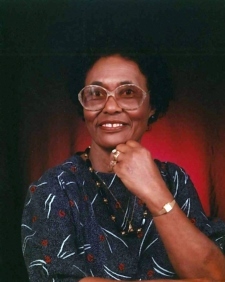 Lillie Mae Johnson, 91, passed away Thursday, Nov. 22, 2018, in Glenpool, OK.
Funeral services will be at 11:00am Friday, Nov. 30, 2018 at Antioch Baptist Church in Duncan, OK with the Rev. Willie H. Irvin officiating. Interment will follow at Henderson Harris Cemetery. Services are under the direction of Don Grantham Funeral Home. Lillie was born August 1, 1927 to Robert and Dora Richardson. She attended school in Elmore City, OK. She gave her life to Christ at an early age and was baptized at Little Flock Baptist Church in Elmore City. Upon moving to Duncan, she joined St. Stephens Missionary Baptist Church where she actively served for more than 65 years until she became ill. While residing in Glenpool, she was under watch care at Mt. Olive Baptist Church in Sapulpa, OK, where Rev. D’Ricco Day is the pastor. She met Levi Johnson and they were married on September 16, 1944, in Pauls Valley, OK. They were the parents of six children, but she became Mother and Grandma to many in the community. Lillie worked for Duncan Public Schools in the Duncan Junior High School Cafeteria as the lead baker for almost 20 years. In addition, she worked for the First Baptist Church of Duncan for more than 20 years, where she became well-known for her homemade rolls. She enjoyed cooking, sewing, embroidery, crafting, spending time with her family and working in her church. Lillie is survived by three children: Fay L. (Cecil) Williams of Glenpool, Jessie J. (Tina) Johnson and Betty J. (Victor) Crawford, both of Duncan; Grandchildren: Deneen L. (Kent) Ross of Dayton, OH, Stephanie D. (Jeffrey) James of Midwest City, Rochelle Johnson-Ells and Rhonda Johnson, both of California, Wanisha Lee of Edmond and Korpez L. Taylor of Duncan, Marcellus A. Smith of Moore, and Winston Tease, Jr., of Phoenix, AZ; Great-Grandchildren: Jonathan D. Tease of Atlanta, GA, Courtney R. Ross of Columbus, OH, Jamilia Ferdinand of New York, Koriah Ayala-Taylor of Duncan, Kent L. Ross, Jr., of Dayton, OH and Korpez L. Taylor II of Duncan; Siblings: Lela “Doll” Harris, Delia M. Gowan, Emma Geretta, all of Oklahoma City and one brother, A.C. (Sandra) Richardson, of Amarillo, TX; Sisters-in-law: Carrie Hill, Lorene Johnson, both of Tipton, Cleo Hampton of Duncan; nieces, nephews, cousins, and a host of friends. She was preceded in death by her husband, Levi; her parents, Robert and Dora Richardson; her daughter, Margie Nell Johnson; her two sons, Roger Johnson and Charles E. Johnson and her brother, L. C. Richardson.